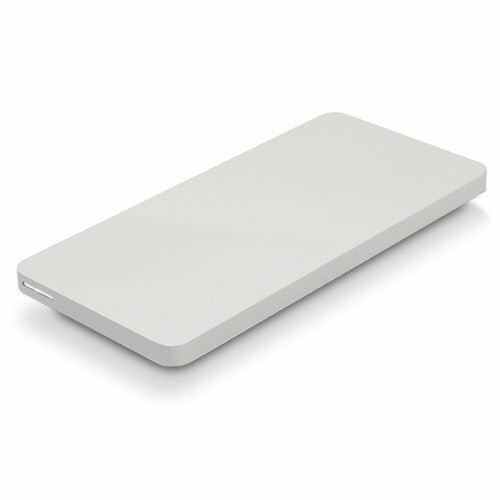 OWC 480GB Envoy Pro EX USB 3.0 Portable SSD Solution. Ultra-portable, SuperSpeed bus-powered external SSD storage solution. The OWC Envoy Pro EX offers rugged, high-peformance capabilities in ultra portable format. Easily carried in a coat pocket, backpack, or briefcase, the anodized aluminum body securely houses an OWC Aura Pro 6G Solid State Drive offering 100x greater protection of your valuable data than even an Enterprise class hard drive. With blistering fast transfer rates of up to 500MB/s, the Envoy Pro EX can handle any demanding storage and/or backup need in the office or on the road. And because it's USB 3.0 bus-powered*, the Envoy Pro EX doesn't require an AC power adapter, making it the ideal Plug and Play external storage solution. The Aura Pro SSD utilizes DuraWrite? Technology and highly intelligent block management to ensure the highest obtainable endurance and reliability. As a result, the Aura Pro equipped Envoy Pro EX can operate for years in demanding use applications without daily write restrictions. This adds up to a MTTF that is higher than most enterprise class hard drives and SSDs on the market today. Additionally, as there are no volatile memory elements in the Aura Pro, the need for cache is completely negated. The Envoy Pro EX drive is just that fast from the get-go! The Aura Pro 6G offers leading performance with a time-proven design. We drew upon our experience in developing the first and only SSD upgrades for 2010-2012 MacBook Air to create the industry's only upgrade for Apple's revolutionary MacBook Pro with Retina display. As a result, you will experience the highest quality and reliability offered in an external SSD-based drive. *Requires USB 3.0 standard powered port. USB 2.0 use not supported or recommended. Includes: OWC Envoy® Pro EX USB 3.0 bus-powered Storage Solution with an OWC Aura® Pro SSD inside, Carrying Case, High-quality double-shielded USB 3.0 standard A to Micro-B connecting cable, 3 Year OWC Solution Limited Warranty with 48-Hour Service Turnaround Time. Bus-Powered USB 3.0 Storage Solution, no AC adapter needed-USB 2.0 use not supported or recommended.